if it’s not a cake, what is it? A couple of years ago, cupcakes and cupcake trees were all the craze for brides everywhere – and for good reason. Portion control, not having to assign someone the (messy) role of cutting slices of cake for all of your guests, and the variety of flavours were all very good arguments for having a lot of mini cakes instead of one big cake. Also, let’s not forget how cute and adorable cupcakes can be, with endless decoration options. Then, as all good trends do, the cupcake craze gave way to good ol’ fashioned wedding cakes again – two, three, four, or even ten tiered wedding cakes were making a beautiful and dramatic statement, with just even more personalization options than ever. Now, what was old is new again. What has been tradition overseas is now making its way to North America, and again, for good reason. 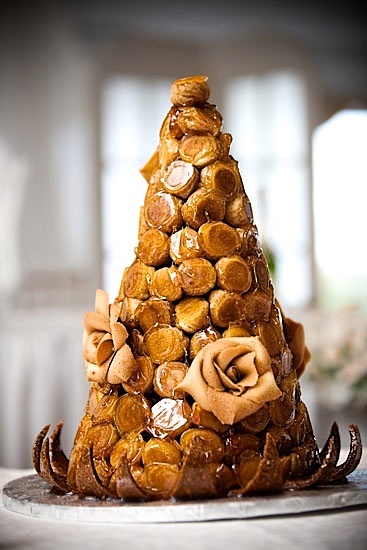 Crouquembouche towers have long fascinated and entranced people. With a delightful name that translates to “crunch in the mouth,” mystery, exotic flair and the unknown surround this confection. 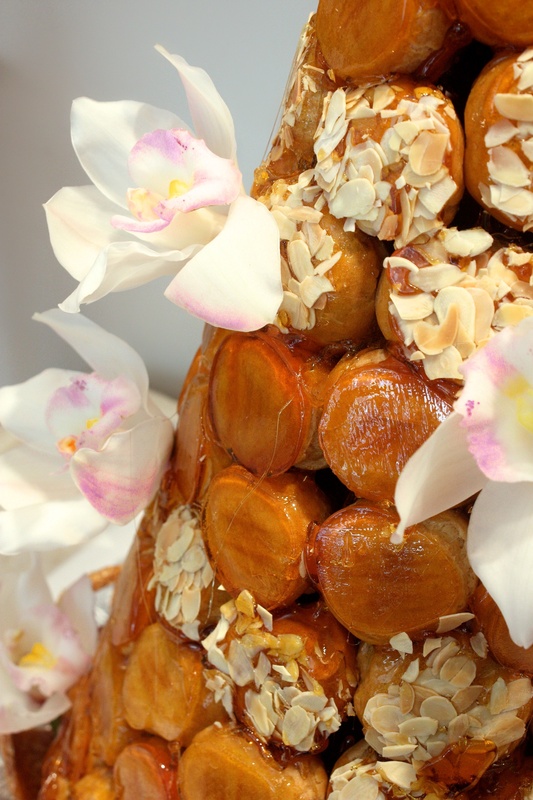 The towers that we make at La Bamboche can be made with as many pieces as required, but with the minimum requirement of at least 30 pieces to create a beautiful crouquembouche. Profiteroles are filled with a variety of pastry cream flavours, and then dipped in caramel before arranged in the famous tower shape. 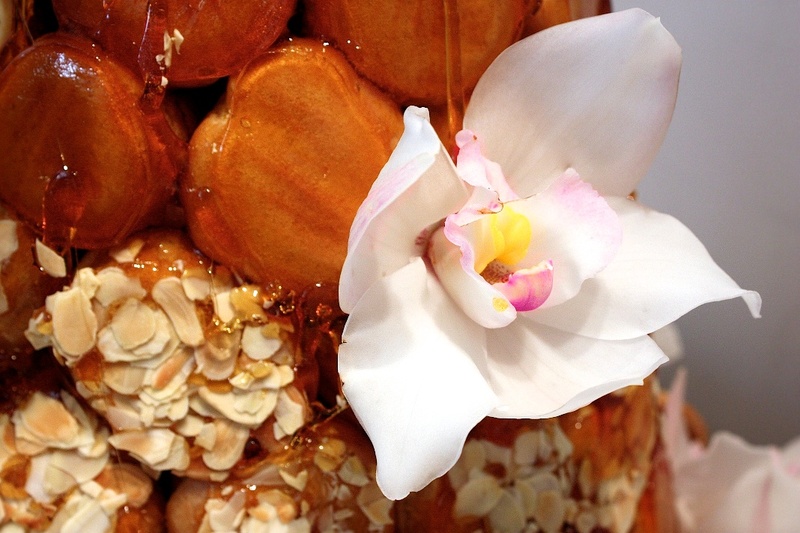 Spun sugar, caramel, sugared almonds, flowers and ribbons can be used to decorate this centre piece to the bride’s desire.. 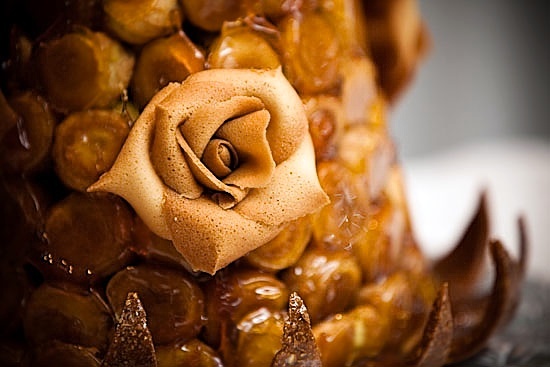 If you want the entire croquembouche to be edible, choose beautiful tuile roses. 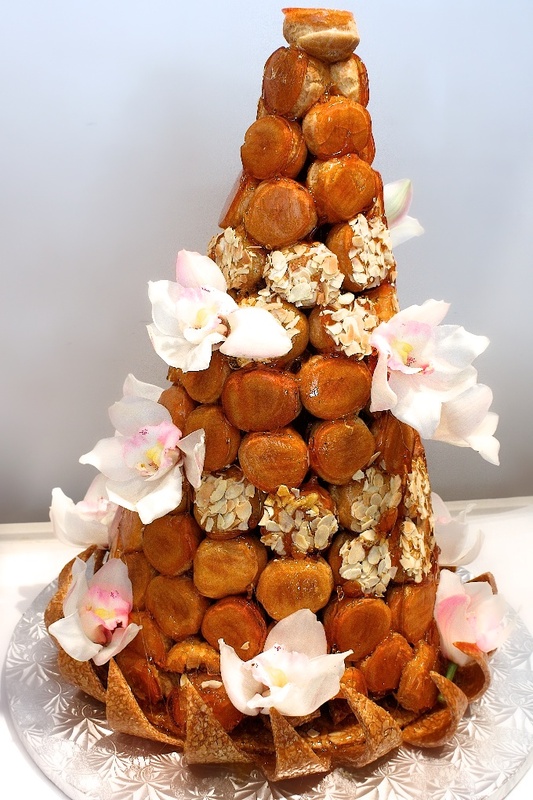 For the second croqouembouche shown here, we decorated only a few key pieces of profiteroles with toasted almond sliced to add texture and variety, and then used organic lilly flowers for an eye-catching yet very elegant statement. If you would like to see our other cakes, take a peek at website. and these beautiful organic lillies embody elegance and simplicity.